ArtAID - Art In Service of Humanity, Tribute of Ultimate Sacrifice, Heroes and Members of Uniformed Services. ArtAID: Art in Service of HumanityTM. ArtAID gives artists and designers a socially responsible means to make a living. ArtAID helps artists make this world a better place serving humanitarian issues and charitable causes, fundraising efforts and events for non-profits in times of need. ArtAID Signing Deed of Gift to National Memorial. Check our Facebook page for the latest updates and details of this historic ceremony. A "Celebration of Life" memorial service for Lorenzo "Pito" Maldonado will be held on: Saturday, February 6th, 5:00pm, at Oak Grove Church of God, 6830 N. Habana Avenue. In Loving Memory for the victims of Sandy Hook Elementary School, Newtown, Connecticut. A beautiful angel design was created loving memory of the victims of this tragedy. Commuity Condolence Kits are being distributed children around the country to participate in national statement of solidarity. Police ANGEL by Keith Hernandez De Cesare Piaseczny Another of New York's Finest, PO Arthur Lopez murdered in the line of duty. Officer Arthur Lopez, a member of the elite Emergency Services Unit, chased a Honda he saw flee a crash until the driver stopped at the corner of 241st Street and Jamaica Avenue in Bellerose Terrace, where the suspect shot Lopez in the chest, killing him at 11 a.m., police said. 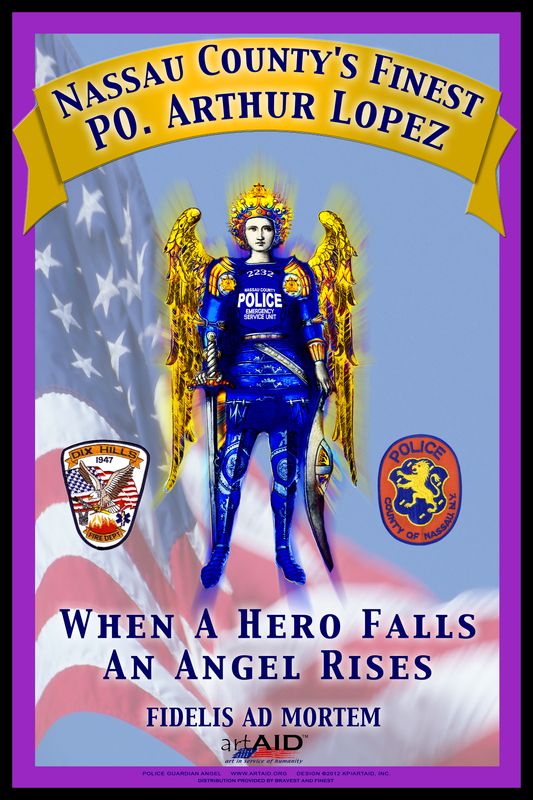 The Guardian Angel "When a Hero Falls An Angel Rises" was created by ArtAID artist Keith Piaseczny. 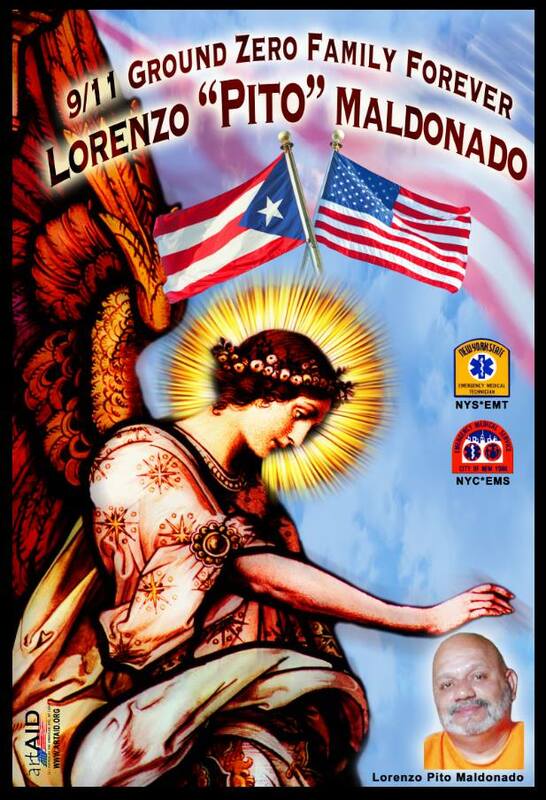 FDNY ANGEL by Keith Piaseczny Bravest Mourn Loss of FDNY Lieutenant Killed in Brooklyn Fire. The New York City Fire Department is mourning the loss of a 17-year veteran who died Monday while battling a warehouse fire in Brooklyn. Flags at Engine Company 237 in Bushwick have been lowered and purple and black bunting installed in memory of Lieutenant Richard Nappi, 47. A moment of silence was observed Tuesday morning outside the firehouse. A NYPD Hero Police Officer, Peter Figoski, Lost in the Line of Duty. 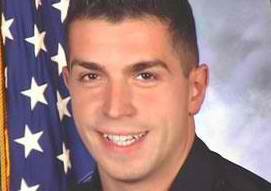 Police Officer Peter Figoski was fatally shot in the face while responding to a call. A decorated NYPD cop, FIgoski, who could have retired two years ago, was shot by a burgler. Figoski was taken to a hospital, where he died about five hours later. The 47-year-old officer father of four daughters: Carolyn, 16, and Corrine, 14, both in high school, and Christine, 20, and Caitlyn, 18, who are in college upstate. Kelly and State Police Lt. Michael Greco arranged to have them flown by helicopter to Albany, N.Y., and then by state police plane to Kennedy Airport so they could be with their father. “Our father would be so honored and so proud by all of this, and is forever in our hearts. It is said when a hero falls, an angel rises. ArtAID Distributes "NEVER FORGET" Artwork to Families of September 11th. ArtAID has given thousands of "Never Forget" prints to the families of September 11, including those attending the 911 Commission hearings in New York City on May 18 and 19, 2004. This print was also given to the families on the 2nd Anniversary.and 3rd Anniversary. By noon on that day no prints were left, leaving many families waiting to get a copy. Many immediate and extended familiy members, friends and co-worker of those lost on September 11 continue to request additional copies of this print. Dear friends of ArtAID's Facebook "Group" - we are moving to a Facebook "Page" http://www.facebook.com/pages/ArtAID/202784789746049 and to get started, and we need you all to become our fans by clicking the link and Like us... it will just take a second, thank you! 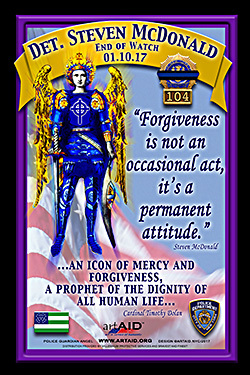 ArtAID has produced and distributed an inspiring series of Angel Memorials paying tribute to all agencies and uniformed officers that gave their lives in the line of duty on September 11. They have been embraced and loved by all. 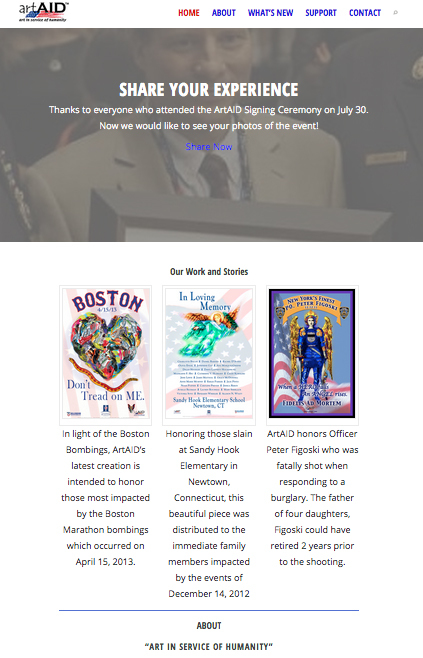 After two years of dedicated free distribution efforts, you may now help ArtAID an support the ongoing works of this unique September 11 Organization and receive a your choice of prints as a sign of our appreciation. ArtAID has continued to expand its important mission of creating and providing artworks that honor heroes of the unformed services in support of numerous organizations and memorial events. Art in Service of Humanity. ArtAID helps those in need through the creation and distribution of public service artworks and installations intended to inspire and elevate the human spirit. Since the attack on the World Trade Center, ArtAID has developed a unique relief program of "healing art" that began by honoring heroic uniformed officers and others that answered the call on September 11th, including firefighters, police, paramedics, emergency service personnel, recovery workers and volunteers. For those most affected by this tragedy, ArtAID sponsored the free distribution of a beautiful series of Angel Memorials such as the Firefighters Angel , the NYPD Guardian Angel, and the EMS Healing Angel. 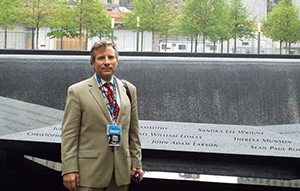 ArtAID also installed and maintained the Ground Zero Memorial, the first installation of its kind to memorialize the names of all the victims of the terrorist attack on the World Trade Center. ArtAID also commissioned an artwork honoring the shared experience of Oklahoma City and New York, which was presented to the Oklahoma City National Memorial and recently sponsored the creation of a beautiful Icon of Archangel Michael for St. Nicolas Church, a Greek Orthodox Church that was destroyed when the World Trade Center collapsed. After the second anniversary of September 11, ArtAID continues to work on behalf of the victims, family members, rescue workers and survivors. ArtAID recently sponsored the distribution of the Guardian Angel Memorials for Detectives James V. Nemorin and Rodney J. Andrews, killed in the line of duty on March 10th, 2003 and more recently the Steven Rucker Firefighters Angel, in tribute to the only firefighter killed fighting the tragic wildfires in California. ArtAID provided banners and remembrance cards for the NYPD ESU Ronny Kloepfer Annual fundraiser. And provided artworks for the National EMS Memorial Services in Roanoke, Virginia. 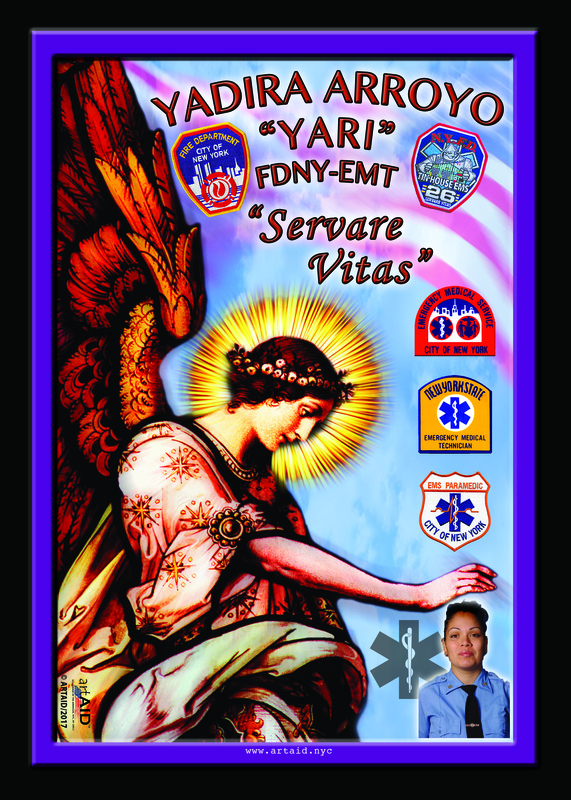 On the second Anniversary of September 11 ArtAID provided a series of beautiful banners of the ESU Guardian Angel for all the quarters of the NYPD Emergency Services Units and prints for all members of this elite squad of highly trained uniformed officers dedicated to our safety. In remembrance of all lost on September 11, ArtAID provided "Never Forget" prints to immediate families visiting Ground Zero on the Second Anniversary, and distributed thousands of prints through the Family Room at the LMDC at One Liberty Plaza. Incorporated in the State of New York as a arts organization, the works you view on this website are not commercially available anywhere, and only available through our free distribution programs or by supporting this effort through our membership program. PLEASE SUPPORT ARTAID NOW. ArtAID needs your help to continue.. Please support ArtAID now. ©ArtAID 2011 Art in Service of Humanity.This site and the was created by Keith Piaseczny, All Rights Reserved.